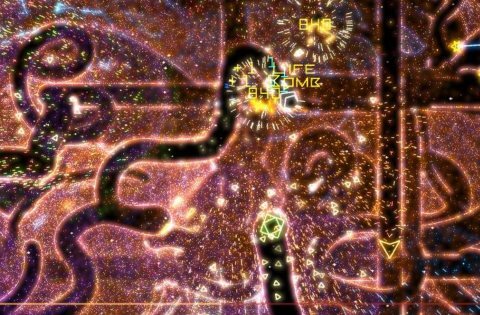 Like many of the modes in Geometry Wars 2, Sequence used to have a gimmick; a play on the Ikaruga colour switch mechanic. The colour switch was represented as a flipping of the grid. You played on either the top, or bottom; pressing the trigger on the joypad would flip the grid over and place you on the other side. Enemies on the opposing side were visible, but hazed out. I don't have a screenshot of the grid flipping, but here's one with particle decay disabled instead. Spawns always appeared on your side of the grid, you could use this to spread enemies out between the sides by flipping just before they appeared. As you would only hit enemies on your side, this allowed you to escape particularly difficult situations by correctly timing the flip. As the levels in Sequence were designed rather than random I was able to create particularly nasty situations for the player, forcing them to flip sides when I wanted, or even feigning them into flipping, only to have a group of enemies they previously flipped away from be thundering towards them as they emerged. It created some interesting play styles too, such as double flipping to momentarily shift from one side of the grid to the other to avoid an incoming wave of enemies, and allowed the creation of enemies that interacted with the player on both sides of the grid (such as an enemy that can only be destroyed from the opposing side to which it spawned). 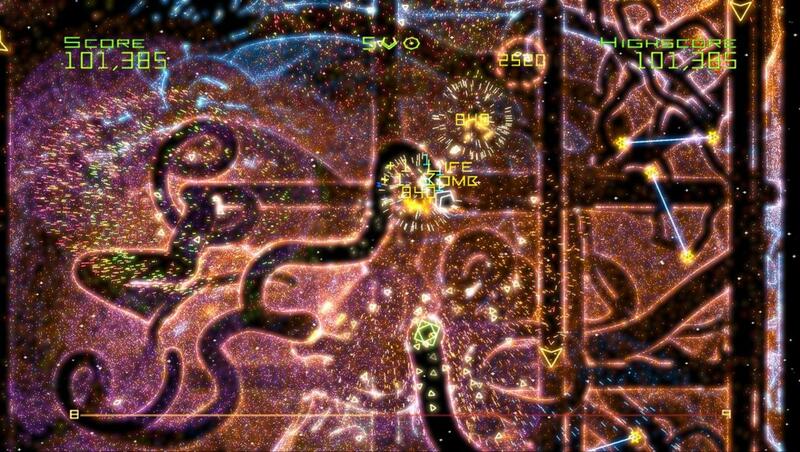 Of course, anyone who has played Sequence probably knows the mode is pretty hectic. I wanted it to be constantly throwing new situations at the player, so they’d have something to learn with each additional level reached; but also have that retro arcade feel that if you die, you do have to start from scratch. Hopefully each time learning a little more, advancing a little further and experiencing something new. But while Sequence as it exists today is hard, Sequence with the grid flip was absolutely brutal! It was as if the player was playing two games of Geometry Wars at once, you had to keep track of what the enemies on the other side of the grid were doing, so that if you needed to flip, you wouldn’t hit them. Plus, as the mode was designed to force you to flip on occasion, you had no choice but to try and wrap your mind around it. To hammer more nails into the coffin, it was difficult to explain to new players what was going on, and the idea completely broke down in multiplayer… So with regret, I cut the flip.